As I drew with my back to the wall of the abbey of San Martino (built in 1400), cars squeezed by one by one, then headed left or right before me. Pedestrians trickeled by, too. This is the narrowest opening of the walled city of Viterbo, called Porta San Pietro. Looking over at the big wooden door to the entrance, I wondered when was the last time they closed it. It was the large unusual shadow formation that attracted me to draw here. But as time went on, I became more and more interested in the wall on my right. It held a strange mix of elaborate relief sculpture and clunky electricity boxes. The wall seemed a good illustration of the beauties and blunders of the entire city of Viterbo, sometimes referred to as "The City of Fountains." Soon after working at this spot, I learned that the wall was in the news. There was renewed interest and anger in the newspapers about the wall's missing feature. It seems that it held a wonderful fountain long ago. Now, the fountain lies separated and abandoned outside of the walls. Perhaps it was moved to relieve traffic congestion, or to provide parking spots. But what's left behind is odd, and in retrospect, foolish. 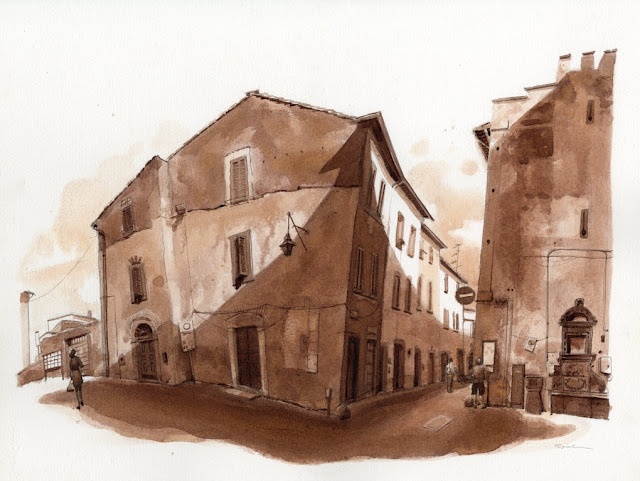 Viterbo is an authentic untouristed town with real problems, including the preservation of its long history. But, a growing group of citizens are calling for the fountain's return. Unfortunately, if water should flow again in a returnerd fountain of Porta San Pietro, it would itself be the next problem. That's because the city's water has been found to have unhealthy levels of arsenic, leaving residents to live off bottled water for well over a year. Double trouble.